Revenue in the Food & Beverages segment amounts to US$51,927m in 2019. Revenue is expected to show an annual growth rate (CAGR 2019-2023) of 10.1%, resulting in a market volume of US$76,300m by 2023. User penetration is 27.8% in 2019 and is expected to hit 36.2% by 2023. The average revenue per user (ARPU) currently amounts to US$42.97. In global comparison, most revenue is generated in China (US$21,945m in 2019). The eCommerce market segment Food & beverages contains the online sale of fresh and packaged foods (excluding baby food), delicacies and beverages. This market segment covers for example the sale of fruit, vegetables, pasta, snacks, sweets, refrigerated products, frozen food, soft drinks and alcoholic drinks via a digital channel. The most significant channel for the online sale of food and beverages are, at present, the online shops of the large supermarkets and warehouse stores, for example, walmart.com or subscription services such as HelloFresh. Not included in this market segment are delivery services of ready-to-eat meals. All monetary figures refer to the annual gross revenue and do not factor in shipping costs. Reading Support Revenue in the Food & Beverages segment amounts to US$51,927m in 2019. Reading Support The Food & Beverages segment is expected to show a revenue growth of 14.5% in 2020. Reading Support In the Food & Beverages segment, the number of users is expected to amount to 1,620.7m by 2023. 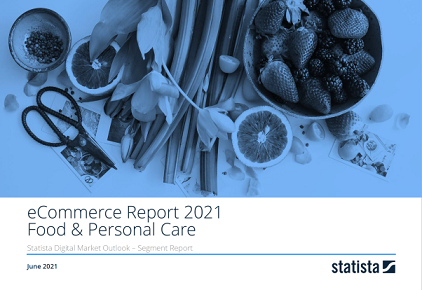 Reading Support User penetration in the Food & Beverages segment is at 27.8% in 2019. Reading Support The average revenue per user (ARPU) in the Food & Beverages segment amounts to US$42.97 in 2019. Reading Support In the year 2017 a share of 34.7% of users is 25-34 years old. Reading Support In the year 2017 a share of 50.6% of users is male. Reading Support In the year 2017 a share of 39.8% of users is in the high income group. Reading Support With a market volume of US$21,945m in 2019, most revenue is generated in China. Reading Support With a rate of 56.8%, the user penetration in the Food & Beverages segment is highest in United Kingdom. Here you can find more studies and statistics about "Food & Beverages".